Sun Entertainment Culture Limited's CEO Chau Cheok Wa(周焯華) and wife Heidi Chan(陳慧玲) were recently reportedly in the process of getting divorce. Subsequently, during a friend's birthday party, the two seemed to have cleared the bad air between them. Chau Cheok Wa even sang two love songs in front of everyone for Heidi in hopes of a reconciliation! The two were together once again earlier tonight attending the banquet for the "Fukien Women's General Association of Macau(澳門福建婦女會)". As the chairwoman of the association, Heidi appeared wearing an elegant white dress while sporting an avant-garde fishnet hat. 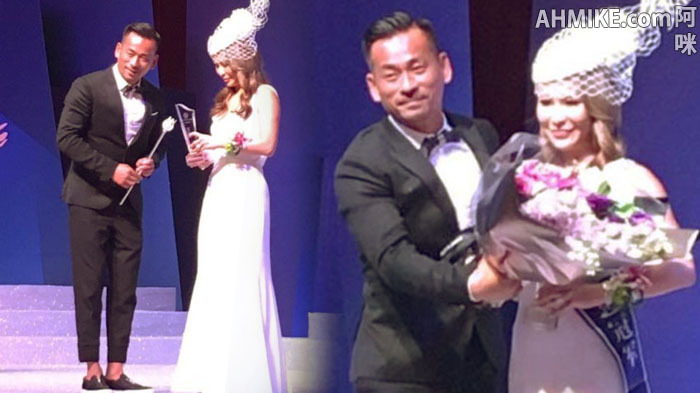 The Best Dressed Award went to Heidi tonight so the committee also assigned Chau Cheok Wa to present the award to her! As the two were standing on the stage together, everyone in the audience started to cheer for them. The two looked at each other with a smile after Chau Cheok Wa handed Heidi the staff, the glass plaque, and flowers. (ahmike.com) Can you imagine how much jealousy Mandy Lieu must be feeling if she sees this!? Its always hard to let go but harder to hold on. Good luck! Ohh stahp it already. Let the man choose one or the other and stop trying to force something that's already broken.